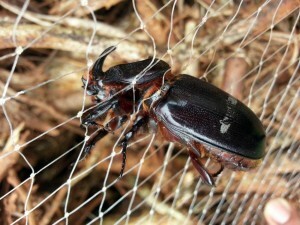 Tekken, a gill net used by Chamorro fishermen for centuries, has proven to be an effective trapping tool for coconut rhinoceros beetles. The coconut rhinoceros beetle, (CRB) discovered on Guam on September 11, 2007, is a serious pest to coconut and other palms. Trees are damaged and sometimes killed when adult beetles bore into crowns to feed on sap. Based on a delimiting survey that found CRB only in a small area around Tumon Bay and Faifai Beach areas, it was decided to attempt eradication of the beetle from the island before it spread further. “We were led to believe that we could trap all beetles using pheromone traps. The standard CRB pheromone trap is a 5 gallon plastic bucket fitted with plastic vanes and lure. CRB adults fly just after sunset and are attracted to a commercially available aggregation lure hung in a hole near the center of the vanes,” said Aubrey Moore, UOG extension entomologist. 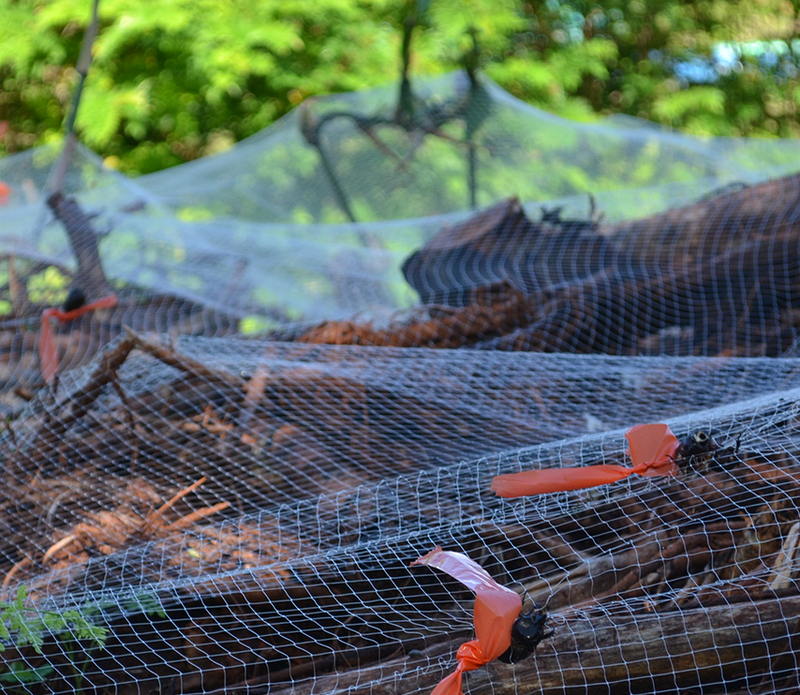 The Guam CRB Eradication Project built hundreds of pheromone traps and deployed these throughout Tumon and Faifai. Unfortunately, the mass trapping was ineffective in preventing the spread of the beetles. After about a year, the project gave up on using traps for population suppression, but still maintained a network of pheromone traps throughout Guam for detection and monitoring. Control efforts shifted to sanitation: finding and destroying CRB breeding sites where 90 percent of the CRB population is found. CRB breed in piles of decaying organic matter. In an active breeding site one finds adults and large numbers of grubs, which do not damage trees, but rather accelerate the decomposition process by feeding on dead plant material. In December 2013 a rhino beetle infestation on Oahu, Hawaii was detected when a beetle was caught in a pheromone trap on a golf course at Hickam Air Force Base. Subsequently, a very large and active breeding site consisting of coconut green waste was found. It is interesting to note that this breeding site was discovered by Guam native Wilfred Leon Guerrero, a plant protection quarantine officer with the Hawaii Department of Agriculture. In January 2014 USDA assembled a rapid response team on Oahu and invited Roland Quitugua, UOG extension agent and Moore to participate in an eradication planning meeting as “subject matter experts”. In an attempt to prevent adult CRB from leaving the breeding site, the organic matter pile was covered with bird netting as a physical barrier. Unfortunately, direct observation showed that many beetles were able to pass through the net. The holes in the bird netting were too large. Upon return to Guam, Quitugua and Moore started measuring escape rates through different types of nets. When they asked local fishermen for net samples, they were pleasantly surprised to learn that at least two of them, Johnny “Atulai” Taitano and Frank Cushing, were already using pieces of small gill nets known as tekken to cover compost piles on their properties in an attempt to prevent CRB from attacking their trees. Quitugua and Moore are currently developing the tekken trap as a novel, cost-effective tool for monitoring and managing rhino beetle populations. “As a barrier for potential or active breeding sites, the tekken trap is an affordable and easy to use method of reducing rhino beetle populations in residential areas,” said Quitugua. The original idea was to cover compost piles being used as breeding sites to suppress the emergence of adults, which damage nearby palms. Current research shows that compost piles are highly attractive to the beetles, functioning as a trap in a given area. Large piles of organic matter have been covered with tekken at the UOG Agriculture Experiment Station in Yigo and on the UOG campus in Mangilao catching 25 times as many beetles as standard pheromone traps. It should be possible to cover even very large breeding sites efficiently and relatively affordably with little effort.